Officials from the Federal Nuclear Regulatory Commission were in Brattleboro Wednesday to talk about Entergy Vermont Yankee’s annual safety assessment. The plant got high marks from the NRC for safety. 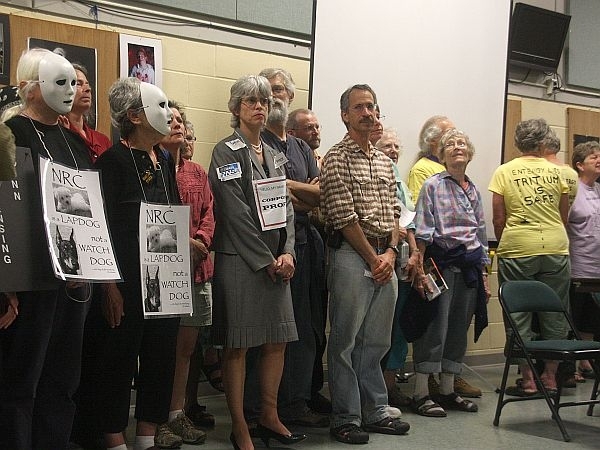 But the NRC got a browbeating when the plant’s frustrated opponents seized control of the meeting. The NRC had planned a two-phase event at Brattleboro Union High School. First on the schedule was an open house where citizens could talk one-on-one with the federal regulators. That was followed by a hearing where speakers could ask questions and voice concerns. But midway through the open house a line of protestors in white masks snaked through the crowd. 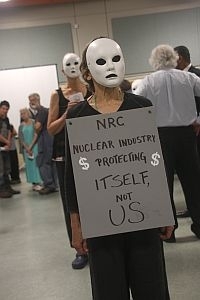 As the hearing time approached the dozen or so masked figures gathered with their signs, behind the tables set up in the front of then room for the NRC panel. Amid shouts of "Democracy!’" from the crowd, NRC Facilitator Karl Farrar tried to established order. "You’re going to get a chance to make any statement you want to make," he told the crowd. "But we can’t have people standing behind us. We’re not going to start the meeting until the people move up in the back." One of the protestors called for a vote. "Who wants to have the meeting to continue with the women standing in front?" she asked. The crowd cheered its approval." With that, about sixty people from the audience jumped up and joined the protestors behind the tables. George Harvey of Brattleboro started the testimony. "Based on the fact that V-Y got through another year without a mishap, we’re expected to believe the plant is safe. But that’s the logic of the nuclear power industry." Eventually the NRC officials, who had left the room, returned, and ran the meeting from the back of the room. Chris Miller, director of Safety for the NRC, explained the scoring system for the plant’s annual assessment. It considers routine inspection findings and a list of performance indicators such as equipment failures and unplanned shutdowns. The Vernon plant had some of both in 2011. But Miller says it earned an A average in safety. "They were in the best area that they could be, which means that any of the findings or any of the performance indicators were at the lowest level, which is green." But people who came to speak had many safety questions. A woman asked about a European study that found higher rates of Leukemia in children under five years old living near nuclear plants. Brattleboro Progressive Representative Sarah Edwards asked for some alternative to the radioactive fuel rods accumulating in Entergy Vermont Yankee’s spent fuel pool, even if that means storage in casks on site. Edwards also said that meetings like these are important. She praised the federal officials for adapting to a difficult situation.